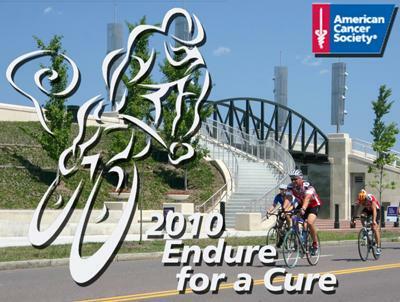 Endure is NEPA's premier charity cycling event, raising over $30,000 to fund research for the American Cancer Society each year. Held in August, it begins and ends on the campus of Wilkes University in Wilkes-Barre, PA and leads cyclists through the many beautiful back roads that wind through Luzerne and Lackawanna counties. The event offers 65 and 35 mile routes for bike enthusiastists, as well as a 12 mile family friendly fun ride off road along the Susquehanna River. Afterwards, participants and their friends, family and supporters discover healthy choices at the Endure Festival, with music, food and fun under the festival tents on the Greenway at the heart of the Wilkes campus. It's a great way to enjoy a summer Sunday, and support a cause that touches so many. For more info visit endurebike.org or call the ACS at 570.562.9749. The 2011 event will be on Sunday, August 7th. Thank you so much for sharing your experience at the 2010 Endure Bike-a-Thon and festival. It's such a great cause and the bike route sounds just beautiful on a summer Sunday in PA. It's especially nice to see a festival that focuses on healthy food.